Why settle for less when you can have the best? In hospitality, a TV plays a peculiar role. It should be hidden for those guests who do not want to see or use it, but be able to produce an exquisite image and beautiful sound for guests who do. The monitor should boast the latest technology and communicate with the hotel’s system. Moreover, it must complement the design of the room and any cables must be hidden so the monitor is integrated into the design of the room. OLED Mirror TV understands all of this. 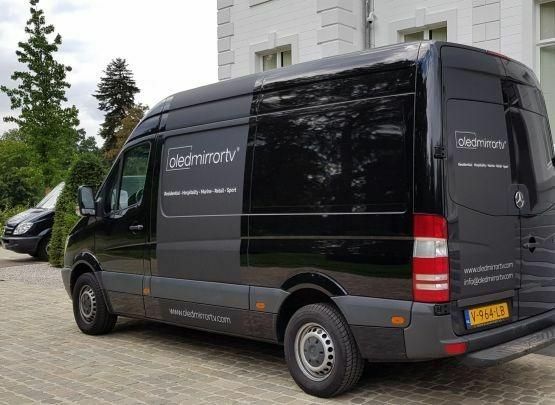 With over 15 years of experience in the mirror and glass television industry, we know exactly how to achieve the right balance between design and functionality – for each client and every placement. Our solutions are crafted using state-of-the-art hospitality televisions, exclusive glass and a wide variety of frame styles. With our professional 4K OLED hotel televisions with IP Smart Solution, OLED Mirror TV offers a high-quality image and impressive durability. Our mirror production process focuses on achieving the best image result as well as precisely cut and polished edges. To ensure quality, we produce the mirrors and glass ourselves and they are exclusively available from us. When not in use, an OLED monitor is not visible through the Secret Silver and Secret Silver Light mirrors, but when it is turned on it offers superior image clarity. With our vast experience, we are able to distinguish ourselves by creating the optimal solution for you. 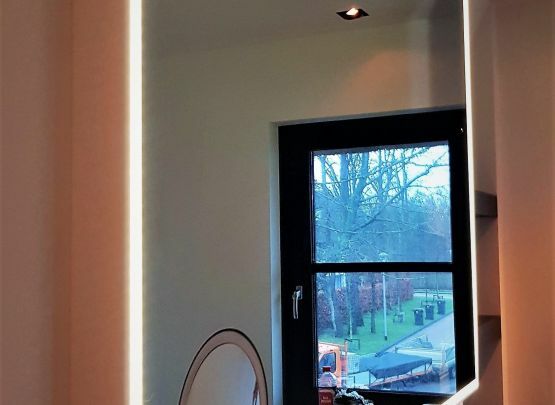 We only supply customised mirrors in order to provide the best result for your situation. The pixels of an OLED monitor consist of organic materials that emit light when electricity flows through them. Unlike QLED or LED technology, there is no need for backlighting, as each pixel can be turned on and off separately. When switched off, an OLED is really black, whereas with an LED or a QLED monitor a visible grey area remains. Another advantage of OLED is that the viewing angles are much greater due to the Nano Cell technology. Moreover, OLED TVs are brighter and have much higher contrast than QLED and LED TVs, whilst the energy consumption of an OLED is much lower. TVs in many places throughout the hotel – guestrooms, bathrooms, dressing rooms, restaurants, bars, public areas, meeting rooms and even outdoors. Everything can be custom made to meet your needs, as every situation is different. You can choose from various frames, types of glass, mirrors, finishes, sizes, shapes, custom cut-outs, as well as additional features such as anti-condensation and speaker installations. If you have demanding guests and take great pride in ensuring that they receive the attention and services they deserve during their stay, why settle for less than the best? Under this heading you will find the all mirror options and the possibilities regarding glass processing. You can order a digital clock for the mirror. This clock is incorporated into the mirror to create a flush surface. You can decide where you want to place the clock in the mirror. 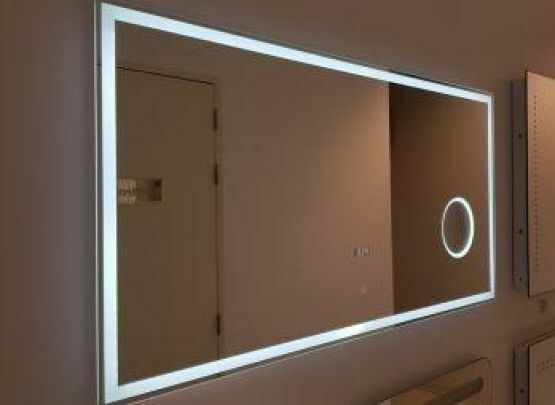 You can order LED lighting for the mirror. 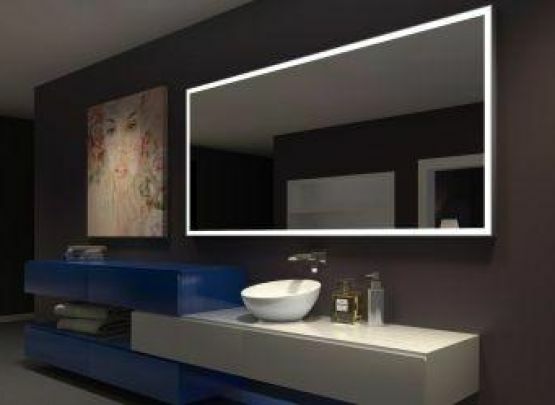 The LED lighting is 5-cm-thin and incorporated into the mirror to create a flush surface. 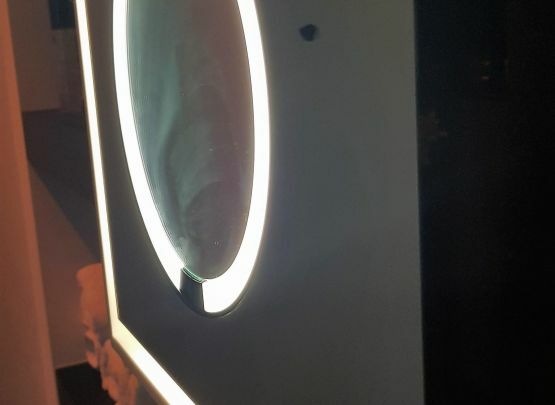 This LED lighting sits 4 cm from the edge of the mirror. You can choose from any of the following options. The LED lighting is available in 2700 Kelvin, 4000 Kelvin and 6000 Kelvin. You can have the mirror equipped with an on/off switch that works when you move your hand near the sensor. Thus you do not need to touch the mirror. It is also possible to order a switch that allows you to manually turn the lights on and off. We can process glass. If we receive drawings with detailed dimensions, we can make an appropriate offer. We can apply the following operations. We can make cut outs in the glass. We do this with a CNC machine or manually. We can also drill holes in the glass for you. This is possible in various drill sizes. Once we receive the drawings, we can make a suitable offer. We need to know the radius or diameter of the hole. The glass we provide comes cut standard. If an agreement has been made on a size and this size proves to be incorrect, then we can cut the mirror (mist hardened) and make it the right size for an additional cost. We would then also charge for collection and delivery of the glass. It is possible to cut the glass or mirror so that it has facets (slanted side). If you prefer the facet to be a special width, please contact us. With a normal silvered mirror, cutting of a facet is possible and the facet remains silver. With a Secret Silver Mirror or Secret Silver Mirror Bright, you can also cut facets into the mirror, but the facet will be black. The Magnifying Mirror is a very exclusive magnifying mirror which is incorporated into the mirror so that it is flush. The mirror (also known as a shaving mirror) is incorporated in the glass in a very nice way and the glass for the shaving mirror is flat. 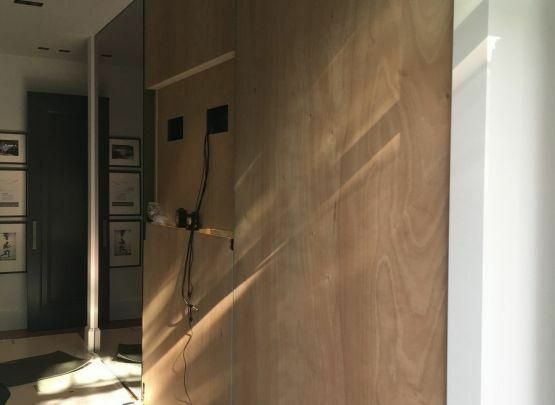 The mirror can be ordered with and without LED lighting. 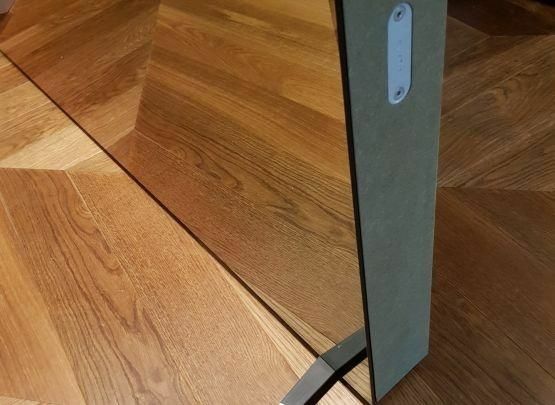 If you order a customised mirror, you can decide where you want to place the shaving mirror. It is also possible to place a touch button in the glass to turn the mirror on and off. You can also switch the shaving mirror on and off via the main switch or a manual switch. The installation team of Oled Mirror TV has been installing the monitors and the glass for more than 15 years. 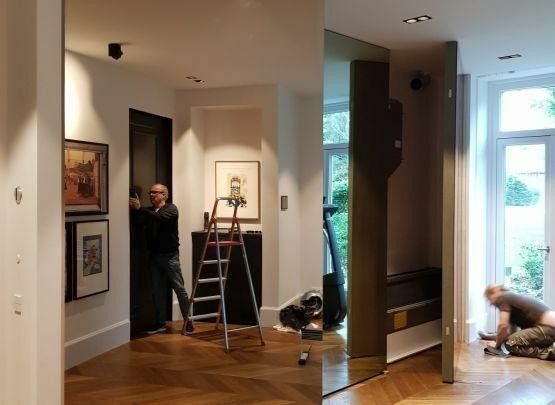 If we have to install mirrors, glass surfaces and monitors, it is especially important that the work is carried out properly. Walls must be straight and recessed coves must be square. These are very important points that often have to be discussed in advance with the contractor and the plasterer. It is then important that in place of a spirit level a cross laser is used by the contractor or plasterer. With this you can see over larger lengths whether something is really straight. It is often the plasterer who uses a spirit level. Here is where it usually goes wrong. Our team consists of a number of trained and certified E-installers, with a VCA diploma. We know better than anyone what is and what is not possible and therefore can fully guarantee the installation. You can outsource the complete installation to us with peace of mind. Approximately 90% of the dealers leave the installation of the glass and the monitor to us. We work safely and punctually! In many cases we get an application from an architect, a dealer or the client ahead of time. This is very convenient because from that moment (and directly at a building meeting) a plan of action is made. The installer and domotics specialist knows where he stands and you do not have to do any unnecessary or duplication of work afterwards. We are happy to discuss the details during a building meeting. We are often asked if we can make rear walls for fitness areas or the mounting for a fireplace using fire-resistant material. 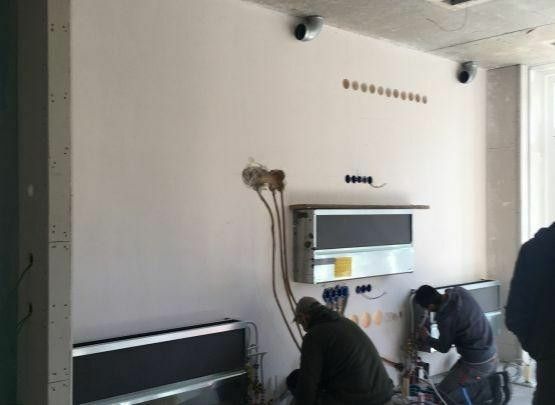 This is no problem for us and we have provided a lot of complete installations. The prices for the installation are listed in our price list, which you can request through one of our dealers. We invoice you at cost for the material that we purchase and need for an installation. 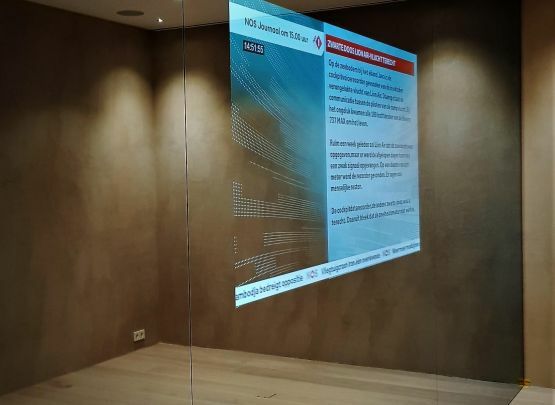 If you have questions about our Oled monitors, Mirrors, Coloured Glass, Smart Retail Mirrors, Hospitality Mirrors or other products and options, please do not hesitate to contact us. We are happy to tell you more about the many possibilities of our products and are ready to convert your desire for a customised design into eye-catching reality. You can also contact us for the prices of our products. You can call 0031- (0) 654 708556, send an e-mail to info@oledmirrortv.com, or use the contact form below. We will of course contact you as soon as possible.